Pie crust is one of those things I get lazy with. And I so don’t know why. I mean, making a pie crust takes minutes. 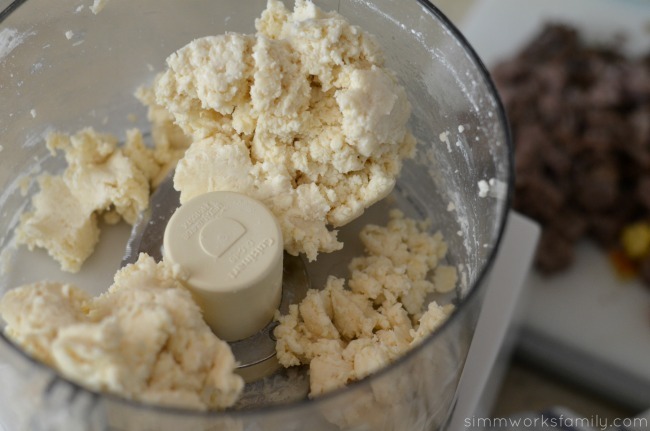 Sure you have to wait for the dough to chill but really… it isn’t that hard if you have a food processor. 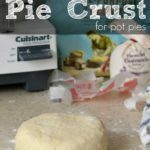 So when I decided to make pot pies from leftovers and found myself without any refrigerated or frozen pie crust (it is the week after Thanksgiving) I decided to just whip up some savory pie crust to use to save time and money. 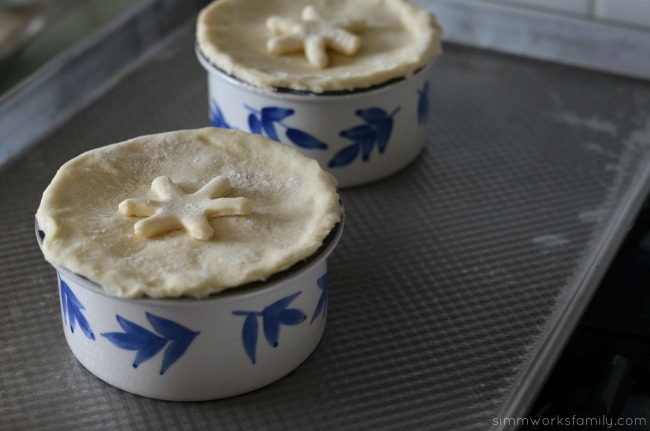 And don’t worry… I’ll be sharing my pot pie recipe with you tomorrow! 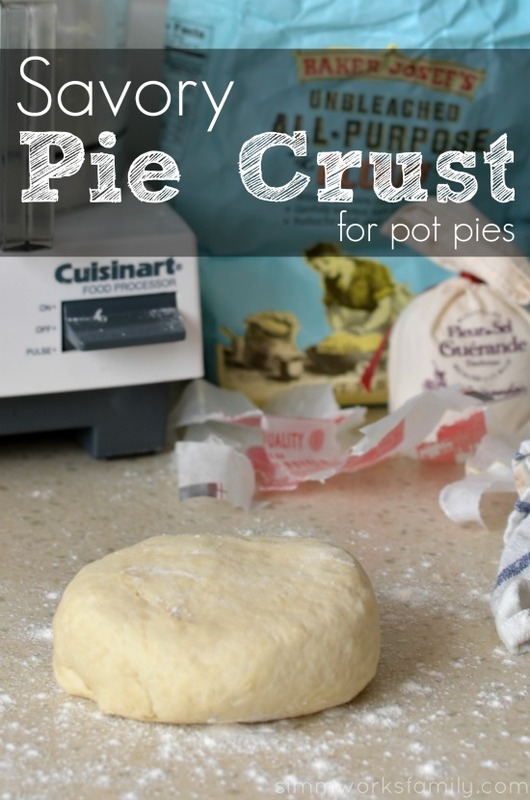 Not only was this savory pie crust good, it was perfectly flaky and delicious with the pot pie filling! 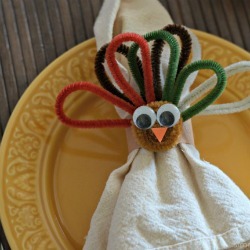 Definitely something I can prepare for a weeknight meal. All you need to make this pie dough are four easy ingredients that almost everyone has on hand. Flour, butter, salt, and ice water. That’s it! And you don’t need much of it. If you use your food processor you can have all of these ingredients mixed up in a matter of seconds. Then you just need to knead the dough for a minute or two on a floured surface and then form into a round disk. Cover in saran wrap and chill for at least 30 minutes. Once the dough has chilled for a bit, bring it out and roll into a flat sheet. 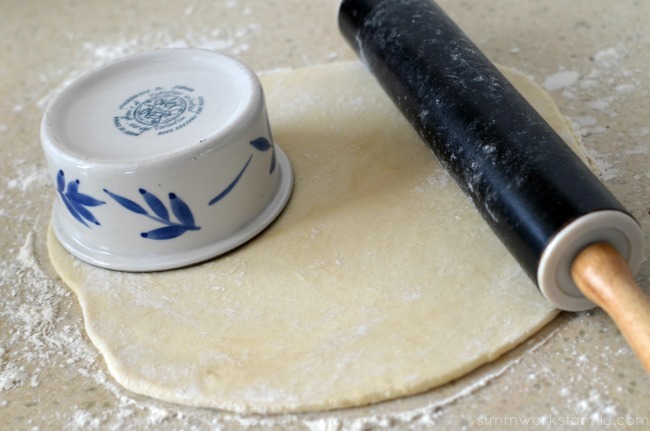 Then use whatever container you’re putting your pot pie filling in and trace the top for the perfect fitting crust. 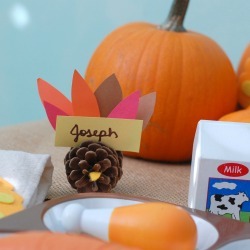 If you want to get all fancy you can cut out additional shapes to add to the top. I chose a cute snowflake to go with the winter theme of this comfort food. 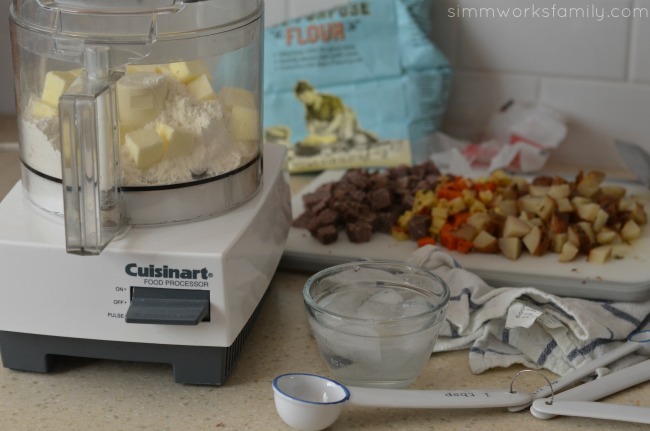 Add flour, butter, and salt to a food processor with blade attachment. Pulse a few times until the ingredients turn into small pea size chunks. Add 1 tablespoon of water at a time, pulsing in between, until dough forms. Don’t add extra water! The dough should not be wet. Once the dough has formed, turn it out onto a floured workspace and knead for a minute or two until dough is smooth. Add extra flour if needed. Form dough into a disk, wrap with saran wrap, and refrigerate for at least 30 minutes before using. What is your favorite pot pie flavor? Thank you for this! My husband LOVES chicken pot pie and I’ve often thought about making one for him, but I never had any clue where to start. I suppose it all starts with a good crust, right? 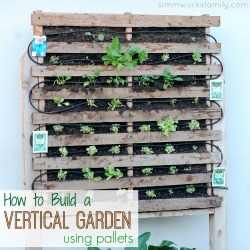 This looks fairly easy and delicious! Now I have to try it! I had given up on making pie crusts…but you have inspired me to start again. Beautiful and definitely looks tasty! Love homemade crust made with butter! Awesome! 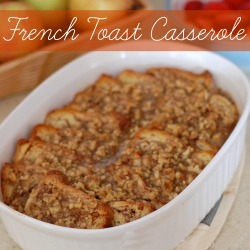 I used this for a breakfast pot pie- It was so easy and delicious and perfectly flaky. thanks! 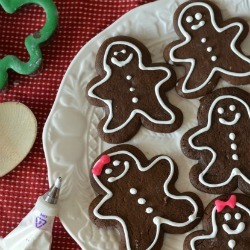 Are you suppose to use unsalted butter with this recipe? I use unsalted butter in all of my baking so it doesn’t throw anything off. I’ll update to clarify! does this make a whole pie? like bottom crust and top crust in a regular pie pan? and does it freeze well? I make batches of 4-8 pies at a time so i can freeze them for later dinners. Yes, top and bottom crust. And I have never frozen the crust before so I don’t know that answer. Sorry!